Commercial ciders, for the most part, suffer from a common problem—they’re incredibly sweet. You might be wondering why you’re hearing about cider on Robin’s beer blog—and why Robin was just referred to in the third person. Let me shed a little light on that subject: Hi, I’m Caroline. I have celiac disease. It’s a super pesky, highly sensitive gluten-triggered immune disorder. Gluten is a tiny protein in wheat, rye, barley, and a bunch of other grains. Drinking beer, which is full of gluten, literally causes my body to destroy itself. My immune system descends upon my small intestine like a biblical plague of locusts. Luckily for me, cider has experienced a resurgence in popularity. There are a number of reasons for this—enough for a separate post—but the important thing is that the end-result is a wider variety of ciders on the shelves, including specialty flavors. And it’s the fall, so it’s pumpkin time. Pumpkin ciders are a kind of odd invention. My theory is that cider brewers noticed the glut of pumpkin beers that were hitting the market and thought, “Hey. Why can’t we do that? Oh wait, NO REASON.” And lo, the brewers gave unto the glutarded masses a pumpkin cider or six. Pumpkin and apple are both fall flavors, so pairing them seems to make sense. But how often do you really see pumpkin and apple combined? Apple flavors tend to be pretty strong, and getting a strong pumpkin flavor requires a LOT of pumpkin. Pumpkin ciders have one kind of large problem to contend with: the spices that taste AWESOME with pumpkin are frequently paired with apple. This means there’s a world of delicious apple baked goods out there—I’m looking at you, apple pie—whose flavors are going to creep into your pumpkin cider. The way some beers deal with this is, I’ve been told, by balancing the savory and the sweet. But let’s be honest for a moment—the range of what is being done with beer is far wider than what’s being done with cider. It’s difficult to balance savory and sweet with a pumpkin cider. Cider is inherently sweet, but the cider that sells is often syrupy sweet. And the quality of a pumpkin cider can really come down to this: how good is the cider itself? I’ve seen four pumpkin ciders so far. Woodchuck’s is, like some of Woodchuck’s ciders, cloyingly sweet and eminently skippable. 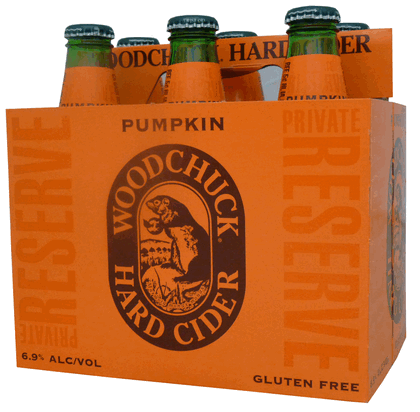 Woodchuck does deserve substantial credit for being one of the first brands stateside to have a range of flavors. They even started introducing seasonal flavors. Unfortunately for me, they largely hang on the sweet side of the spectrum (Granny Smith is notably tart-er, some of their seasonal flavors are solid). Their pumpkin is even sweeter than their typical output, and it’s exceedingly difficult to find pumpkin in the cider itself. a pumpkin cider, I probably wouldn’t have guessed. Harpoon Brewery (yes, the Boston beer folks) has a really solid regular cider—dry, light, a little tart. Not very sweet at all. Unsurprisingly, their pumpkin cider is lovely. Yes, the pumpkin is very subtle, and yes, it still tastes more apple-pie-ish than anything else. But they manage to retain some of the tartness of the standard Harpoon cider. This is no small feat for something that tastes like baked goods. California’s Ace Cider has been a relatively recent addition to East Coast cider selections. Their Joker cider is probably my favorite relatively cheap cider out there by virtue of how tart and dry it is. I was a little surprised when their pumpkin cider ended up being sweeter, but I’ll be honest—I think it works well. 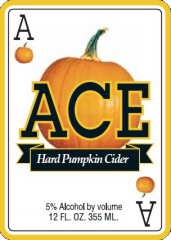 The Ace Pumpkin is probably the first pumpkin cider where I’ve been able to say, “mmm, pumpkin!” This might be more of a statement about my unsophisticated palate. But for an identifiably pumpkin-flavored cider? This is probably your best bet. It’s not as dry as the Harpoon (a close second), but it’s got probably my favorite flavor profile. I’m looking forward to seeing more bizarre cider varieties in my local beer store. New York isn’t close to California’s level of cider paradise yet, but things are slowly making their way over here. This past summer I discovered hopped ciders. Hopped! It’s a brave new world out there for the glutards like me. I am a major fan of anything that comes out of Harpoon – EXCEPT, somewhat ironically, their trademark IPA. Anything else, including their ciders, is proof that God loves us and wants us to be happy. I haven’t had the honey cider. I’m inclined to think I probably won’t love it (honey = sweet, right?) but I trust them enough that I’ll probably end up trying it. I really like the Harpoon Pumpkin Cider. I agree that it’s not overly sweet and the pumpkin isn’t overpowering. I don’t think I’ve seen the others in local stores, but I’ll have to keep an eye out for them.